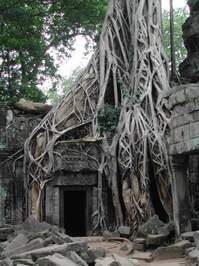 Archaeologists have discovered an ancient Khmer city that predates Angkor Wat by about 350 years using lasers that were able to map surface features through the canopy of the surrounding trees. The city has either been largely destroyed or buried by nature, so do not expect to see the kinds of amazing ruins like Ta Phrom (pictured to the right), but there remain artifacts that have been untouched by looters for centuries. It is so exciting to know that there are still wondrous and amazing places on this Earth still yet to be discovered.